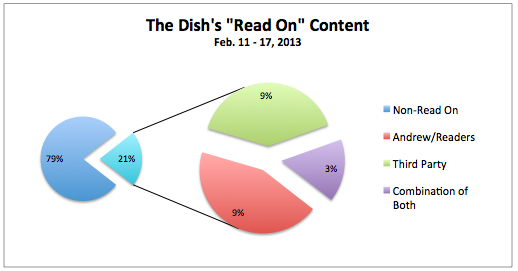 [W]hereas 67.3% of all “Read On” sections before the meter contained mostly third-party content, now the plurality of “Read Ons” (44.0%) consist of content provided by Andrew and his readers (from analysis to letters to views from people’s windows). The proportion composed of third-party content has fallen to 40.0%, with the remaining 16.0% of all “Read On” sections comprised of material that contains both. What this likely means is that Sullivan and his team have taken to heart the precautions of readers and commentators who noted that, to charge for content, the part that’s hidden to non-subscribers should tend to be more original — as opposed to a curation of third-party material. I believe Sullivan mentioned recently that if the pace of subscribers didn’t pick up, he may “nudge” them towards paying their dues. This could happen in one of two ways. Either he could reduce the number of monthly “Read On” clicks it takes to trigger the meter (it’s currently at seven), or he could introduce more “Read On” posts as a percentage of his total posts. As an early subscriber, it doesn’t really matter to me which one he chooses. But so far at least, the content lying beyond the “Read On” button certainly seems to justify the annual fee.